Wow, I did a ton of searches but missed this …until now! To read the interview on the great Monsters and Critics site, click on the below composite/comparison photos. If there is a glitch and this does NOT take you to the interview with actress/performance artist Naomi Grossman, please reply below and let me know so I can fix it. Cool? Here’s some of the highlights from the interview Again, my source is the article American Horror Story: Asylum exclusive: Naomi Grossman’s amazing transformation to Pepper from Monstersandcriritcs.com and written by April MacIntyre, © Nov 8, 2012 – NOT Horror Boom! MONSTERS AND CRITICS: Please, what are the prosthetic and makeup devices they do to you to transform? How long does it take? NAOMI: The make-up process is quite long, though they’ve gotten it down to about 2.5-3 hours. Those first make-up tests took at least twice that though– they are incredibly meticulous– during those first couple times, I remember them very carefully placing freckles almost as if were a work of art! The prosthetics are of course made of silicon, made specifically for my face, and consist of a forehead complete with punched-in eyebrows, a nose, ears, and even a bumpy little spine-piece for my back. Again, depending upon the wardrobe, no one even sees that, but that’s the kind of detail-oriented professionals they are. I have fake teeth, which of course change the shape of my face (and speech). There’s even a wacky lens for one of my eyes– it’s subtle, but effective (it’s disturbing having someone look at you, but not quite look at you, you know?). It seems the only thing that’s truly mine is the hair! At first they toyed with a bald-cap, but given Pepper’s condition, it was important to make my head look as small as possible. So, it was obviously better for them to not have to stuff a bunch of hair into a cap. Though the bald caps they gave me initially looked incredibly authentic as well. I think at one point they’d talked about using CGI to actually shrink my head, but I’m sure it was easier and probably much cheaper to have me shave my head than [to] have to employ such advanced special effects. Besides, the makeup crew takes pride in not having to rely on such tricks. So instead of making my head small, they built up my body by putting me in a fat suit. And well, the end-product is well worth the head-shave and hours in the chair. …I actually have to introduce myself when I’m there out of costume. I’m going to be the girl no one knows at the wrap-party! Is Naomi Grossman aware of what happens for the rest of the season… and how much does she know? M&C: What, exactly, is Pepper’s back story? What insight did Ryan Murphy give you? and was meeting with makeup, that they told me what I’d look like …which obviously informs the character. 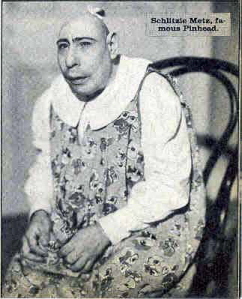 So I spent a lot of time watching and reading about Schlitzie from “Freaks.” That was the inspiration behind Pepper, after all. And though Schlitzie‘s time was well before Pepper’s, he no doubt had a similar, marginal existence. Other than that, I only get the sides I’m in! Sister Mary Eunice (Lily Rabe)’s line about me slicing the ears off my sister’s baby was about all I knew too! M&C: …does she make it all the way to the end of the season? I wholeheartedly agree with that! Check out the entire interview here on Monsters and Critics. Here is the real-life character Pepper was based on – who was actually a man. I recommend this article for more about Schiltzie. *When I say brave, I mean brave. The least amount of money it would take me to shave my head would probably be in the VERY high five-figure range. « Older Post Pepper The Pinhead On American Story Is Based On This Real-Life Performer…	» Newer Post Name That Horror Frame – Week of 11-12-2012 – Special Hitchcock Edition!